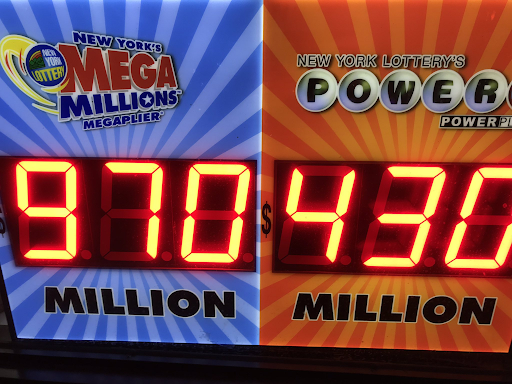 With the Mega Millions Jackpot now nearly $1 billion, people, mostly those in the lower and middle classes, are coming out in droves and buying lottery tickets with hopes of striking it rich. After all, with $1 billion one can even afford healthcare in America. "Lotteries essentially target and encourage lower-income individuals into a cycle that directly prevents them from improving their financial status and leverages their desire to escape poverty. Yes, that’s a bit harsh, and yes, people have the right to make their own decisions. Even bad ones… Also, many people tend to significantly overestimate the odds of winning because we tend to assess the likelihood of an event occurring based on how frequently we hear about it happening. The technical name for this is the Availability Heuristic, which means the more we hear about big winners in the press, the less uncommon a big payday begins to seem." Call it that, or call it what one wishes, the end result is that the lottery is nothing but society's perfectly efficient way of, to use a term from the vernacular, keeping the poor man down while dangling hopes and dreams of escaping into the world of the loathsome and oh so very detested "1% ers". Alas, the probability of the latter happening to "you" is virtually non-existent. Full explanation from Nick Colas, originally posted in 2012, (now of DataTrekResearch) on how and why Americans are lining up in lines around the block to... pay more taxes. Summary: American adults spent an average of $251 on lottery tickets last year. With a return of 53 cents on the dollar, this means the average person threw away $118 on unsuccessful lotto tickets – not a great investment. So why are we spending so much? Well, lotteries are a fun, cheap opportunity to daydream about the possibility of becoming an overnight millionaire, but on the flip side people tend to overestimate the odds of winning. Lower-income demographics spend a much greater portion of their annual earnings on lottery tickets than do wealthier ones. Since lotteries are state-run, that effectively means that the less affluent pay more in taxes (albeit by choice) than broadly appreciated. And even winning the lottery doesn’t guarantee financial success. More than 5% of lottery winners declare bankruptcy within 5 years of taking home the jackpot. Despite their drawbacks, though, lotteries are no doubt here for the long haul – in states that have lotteries, an average of 11% of their total revenues come from lottery ticket sales, and the number is even as high as 36% in 2 states (West Virginia and Michigan). Lottery ticket sales in the US in 2010: $59 billion Average spending per person: $191 Average spending per adult: $251 Chance at hitting the jackpot: (Apparently) priceless. I have never bought a lottery ticket and honestly don’t even know how. And as far as I’m aware, I don’t know anyone who spends north of 200 bucks a year playing the lotto. The only lottery my friends play is the NYC marathon lottery, where they’re gambling for maybe a 1 in 13 chance to fork over $255 for the privilege of slugging out 26 miles through the city’s streets. Not quite hitting the jackpot in most people’s minds. But someone, somewhere is buying all those tickets. In Massachusetts, where the lottery is more popular than in any other state, people spend an average of $634 a year on Mega Millions, Powerball and the like. 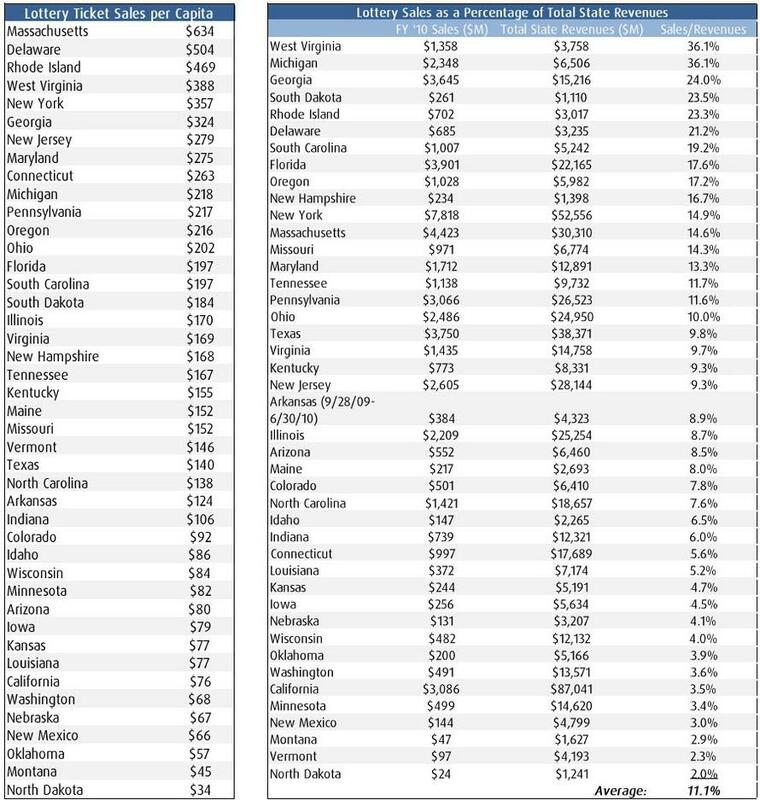 Delaware comes in at number 2 with $504 spent per person, while Rhode Island ($469), West Virginia ($388) and New York ($357) round out the top 5. North Dakota brings up the rear with per capita lottery spending of $34. You can see the full list in the table following the text. It’s difficult to pinpoint exactly who is investing so much money in a product that provides poor returns, but numerous studies show that lower-income people spend a much greater proportion of their earnings on lotteries than do wealthier people. One figure suggests that households making less than $13,000 a year spend a full 9 percent of their income on lotteries. This of course makes no sense – poor people should be the least willing to waste their hard-earned cash on games with such terrible odds of winning. Why bother? Well, one answer is obvious enough and applies to just about everyone who plays. For a buck (now $2 for Powerball) we have a cheap opportunity to daydream what could happen if we suddenly won millions of dollars. But lotteries return 53 cents to the dollar. 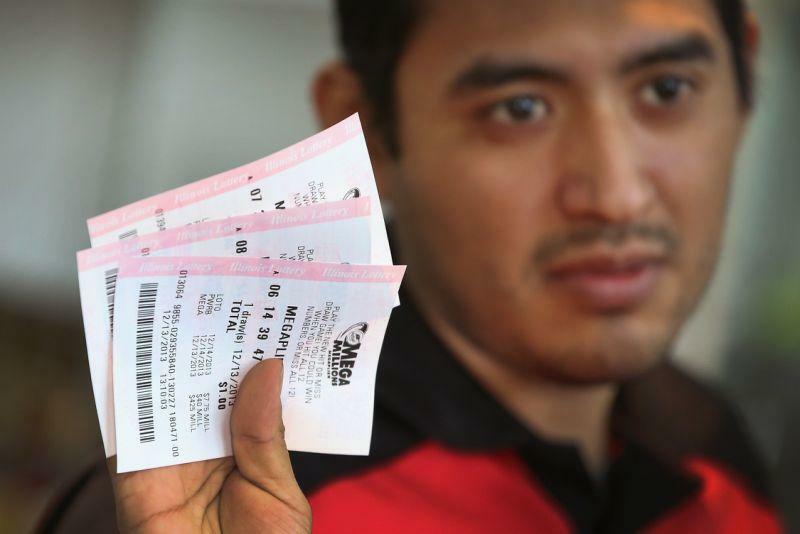 So why are poor people irrationally buying tickets when the probability of winning is so slim? One study by a team of Carnegie Mellon University behavioral economists (Haisley, Mostafa and Loewenstein) suggests it isn’t being poor but rather feeling poor that compels people to purchase lotto tickets. Participants were asked to complete a survey that included an item on annual income. One group was asked to provide its income on a scale that began at “less than $100,000” and went up from there in increments of $100,000. It was designed so that most respondents would be in the lowest category and therefore feel poor. The other group, made to feel subjectively wealthier, was asked to report income on a scale that began with “less than $10,000” and increased in $10,000 increments. Therefore most participants were in a middle or upper tier. All participants were paid $5 for participating in the survey and given the chance to buy up to 5 $1 scratch-off lottery tickets. The group who felt wealthier bought 0.67 tickets on average, compared with 1.27 tickets for the group who felt poor. Lotteries essentially target and encourage lower-income individuals into a cycle that directly prevents them from improving their financial status and leverages their desire to escape poverty. Yes, that’s a bit harsh, and yes, people have the right to make their own decisions. Even bad ones… Also, many people tend to significantly overestimate the odds of winning because we tend to assess the likelihood of an event occurring based on how frequently we hear about it happening. The technical name for this is the Availability Heuristic, which means the more we hear about big winners in the press, the less uncommon a big payday begins to seem. More than 1,900 winners declared bankruptcy within 5 years, implying that 1% of Florida lottery players (both winners and losers) go bankrupt in any given year, which is about twice the rate for the broader population. “Big” lottery winners, those awarded between $50,000 and $150,000 were half as likely as smaller winners to go bankrupt within 2 years of their win, however equally likely to go bankrupt 3 to 5 years after. 5.5% of lottery winners declared bankruptcy within 5 years of bringing home the jackpot. The average award for the big winners was $65,000 – more than enough to pay off the $49,000 in unsecured debt of the most financially distressed winners. Lottery players tend to have below-average incomes, so they are probably less accustomed to budgeting when they receive a windfall. There’s also a psychological term called Mental Accounting that explains how people might treat their winnings less cautiously than money they’ve worked for. Money has come into their possession through luck, which similar to bonus payments, often induces an urge to purchase unnecessary items. But whether you think state lotteries are awful or great, there’s another word for them: essential. In both West Virginia and Michigan, for example, lottery sales accounted for 36% of total state revenues in fiscal year 2010, and on average state with lotteries take in 11% of total revenues in the form of lotto ticket sales. We’ve included the full list in a table following the text. There are still 7 states that don’t have their own lottery systems, so the national average would be lower. Don’t make investment decisions when you are feeling poor. The study we cited earlier clearly shows that you are likely to buy more “lottery tickets” (think of that as a metaphor for any long shot investment) when you feel less affluent than those around you. Lower income individuals likely pay more in “Taxes” than most economic commentators realize. Assuming that the 80/20 rule applies to lottery participation, the bulk of that $59 billion in annual receipts likely comes from 20-25 million less affluent households. That would be about $47 billion from this demographic, or roughly $2,400 per household. Yes, I get the notion that this money is handed over in the hope of a payoff. An ill-advised and mathematically unlikely hope, as it turns out. But does that mean it doesn’t count as a societal contribution?